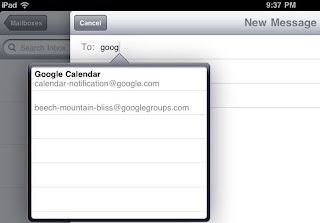 When you start typing an email address in on your iPad, it automatically prompts you to select from any contacts that include that address, and any other recently used email address. 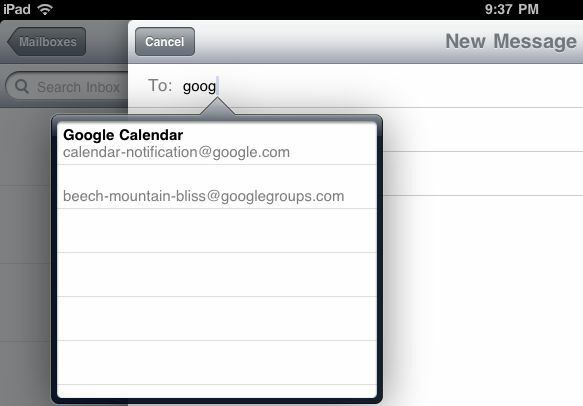 Even if you change an email address for a contact, the iPad will continue to prompt you to pick the old email address. There doesn't seem to be any straightforward way to clear out the cache of all these type ahead email addresses directly from the ipad, or using just itunes. I found this thread in the apple forums for steps on an iphone/ipod, and it seems to work on the ipad too. The process involves doing a complete backup and restore of your ipad. For me the whole process was about an hour. in the Recent Email Address Viewer window select all the addresses you want to delete and click "Delete selected note"
Once this completes the iPad will restart. Now you can create a new message and start typing an old address or name. As long as it isn't in your contacts, it will no longer appear in the autocomplete prompts.